I've been looking forward to the year 2015 since I was a child, and I know I'm not the only one. Thanks to the promises made in Back to the Future Part 2, 2015 was supposed to be a year full of amazing technological achievements, from leashes that walk the dogs by themselves, self-drying jackets, video games where you don't have to use your hands, flying cars, and most magical of all, the Hoverboard. Yes, obviously, Back to the Future Part 2 was a work of fiction and speculation by some Hollywood screenwriters, but when you're a kid you don't know that; I dreamed of a Hoverboard for years, right along with the rehydrated pizzas and self-lacing sneakers, and even with 2015 just three years away, I still can't quite give up on the idea that we might get there in time. And now Mattel, of all people, is actually stepping up to the plate to make the dream come true. 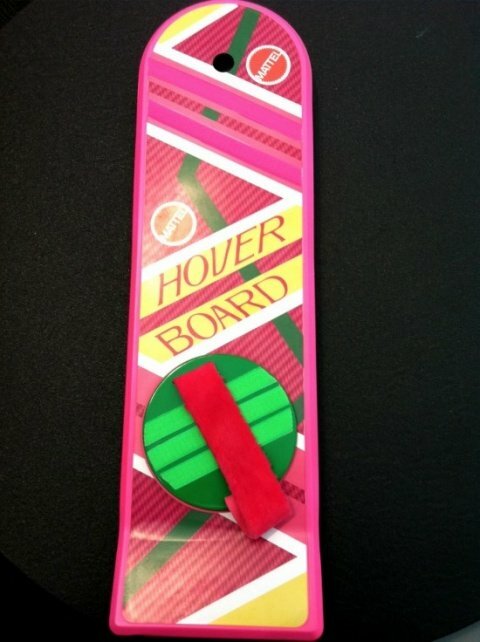 Over the weekend during Toy Fair (via Slashfilm) Mattel announced that they'll be manufacturing hoverboards in time for Christmas this year, with pre-orders available in March. An image of the product has been leaked out of Toy Fair, though if you're familiar enough with Back to the Future, it will probably just look very familiar.